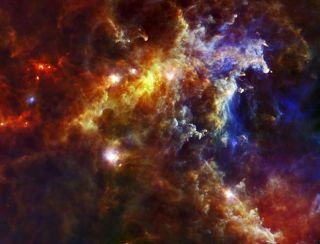 This image from the Herschel Space Observatory shows most the cloud associated with the Rosette nebula, a stellar nursery about 5,000 light-years from Earth in the Monoceros, or Unicorn, constellation. The nebula is a teeming stellar nursery and an excellent place to study the formation of massive stars. A growing family of stars can be seen sprouting in thecolorful Rosette nebula in a new image taken by the Herschel Space Observatory. The region shown in the image is a busy stellar nursery,with groups of stars of different ages. The oldest and most massive members liein the center of the nebula, with younger and less massive generations locatedfarther out in the associated cloud. The nebula's cluster of the most massive stars, locatedbeyond the right edge of the picture, is responsible for hollowing out thecavity. There's enough dust and gas in the entire Rosette cloud tomake about 10,000 suns. Herschel, a European Space Agency telescope that hasparticipation from NASA, detectsthe infrared light given off by the dust of the nebula. The large, embryonic stars uncovered by Herschel are thoughtto be a younger generation. They are located inside the tips of pillars thatappear to branch out from thicker cloud material. The pillars were, in fact, excavated by the nebula's massivestar cluster. Winds and radiation from those stars pushed less dense materialaway from the pillars, and probably triggered the birth of the big stars insidethe finger-like structures. In fact, the pillars point to the location of themassive nebula stars. The intermediate-mass stellar embryos, each a couple oftimes as massive as the sun, are located in the redder regions of the image.The small spots near the center of the image are lower-mass embryonic stars,similar in mass to the sun. Astronomers study regions like the Rosette not only to learnhow stars form in our Milky Way, but also to get a better idea of what's goingon in distant galaxies. When astronomers look at faraway galaxies, they areseeing light from regions that are bursting with massive stars. In order tocompare our galaxy to distant ones, it is therefore important to understand theformationof high-mass stars.